Members of the WKU Habitat for Humanity Campus Chapter will be spending their spring break in Taylorsville, North Carolina. 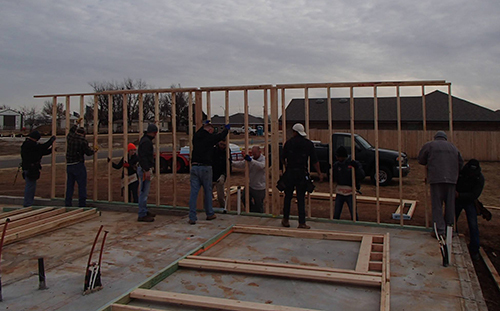 The WKU group will be working on projects with Alexander County Habitat for Humanity next week (March 3-9) as part of Habitat’s efforts to eliminate substandard housing. Participants in the trip include Bryan Reaka, chapter advisor and faculty member in WKU’s School of Engineering and Applied Sciences; Hannah King of Brandenburg, a senior Psychology major; Ayoub Alaufi of Bowling Green, a sophomore Civil Engineering major; Austin Loney of Madisonville, a senior Civil Engineering major; Caleb Harter of St. Louis, Missouri, a junior Manufacturing Engineering Technology major; and Mazin Alabri of Bowling Green, a sophomore Civil Engineering major.